The Solstraum, the chemical tanker where the accident took place, arrived at Eastham in England on 29 January 2011 to load 4526,821 tonnes of ethylene dichloride (1.2 dichloroethane). As part of the preparations, cargo tanks 2P, 2S, 3S, 4P, 5P, 7P and 7S were to be inerted with nitrogen (N2). The operation of adding nitrogen started at 21:05 on 29 January. The operation was monitored by measuring the tanks’ oxygen content. The measurements were started at 05:20 on 30 January. At that time, all the cargo tanks contained less than 5% oxygen. Adding nitrogen was stopped at 06:20. So-called balanced loading/ventilation was then carried out, i.e. nitrogen was released as the cargo was taken on board. Nitrogen was introduced again, from 01:15 to 01:25 on 31 January 2011. 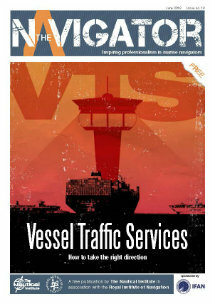 Loading was completed at 01:35 on 31 January 2011. When loading had been completed, the N2 level was topped up and maintained during the voyage to Wilhelmshaven, Germany, where the Solstraum’s cargo was to be discharged. In accordance with the shipping company’s procedures, cargo samples were to be collected in connection with both loading and discharging, so as to be able to document that the quality of the cargo had not deteriorated on board. 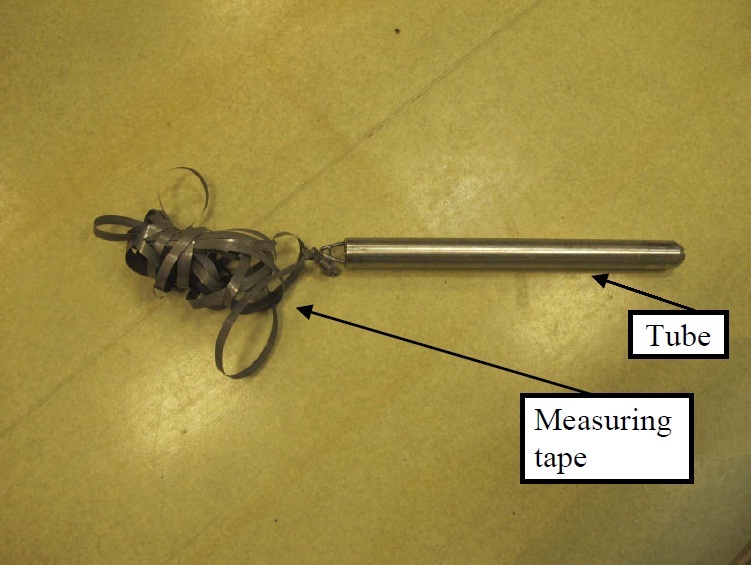 This was to be done by using a device consisting of a sampling tube attached to a steel measuring tape (refer to the image below). The sampling would take place by standing on deck and lowering the device into each cargo tank through a valve in the butterworth hatch at the aft end of each cargo tank. The image below shows the butterworth hatch of cargo tank 7P. 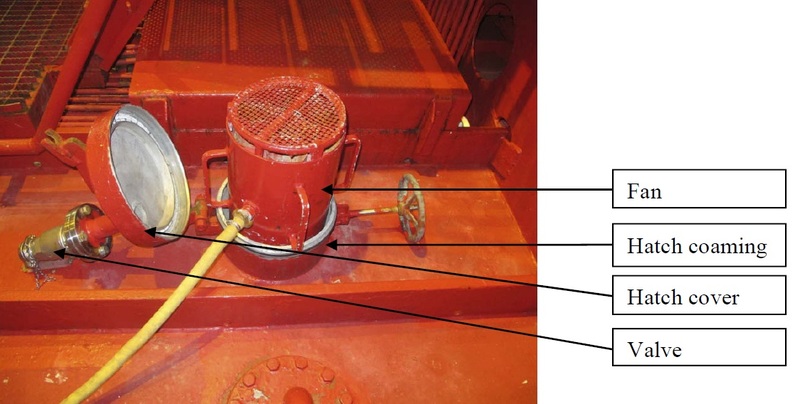 When a cargo sample was to be collected from cargo tank 7P after loading in Eastham, the tube became stuck in the heating coils at the bottom of the tank(see image below). After unsuccessful attempts to dislodge the tube and retrieve the sampling device from the tank, the measuring tape was temporarily fastened above deck to prevent the whole sampling device from disappearing into the cargo tank. Before discharging in Wilhelmshaven in Germany, a pre-arrival meeeting was held at 14:00 on 3 February 2011. The chief officer, the officer on watch and the pumpman were present at this meeting. The discharge operation was planned in this meeting. Discharging commenced at 16:50. Nitrogen was added during discharging, so that the atmosphere in the cargo tanks contained 99.9% nitrogen. Discharging was completed at 05:25 on 4 February 2011. When discharging was completed, the Solstraum set the course for Rotterdam in the Netherlands where the vessel was to take on board caustic soda. The sampling device was still stuck in the heating coils at the bottom of cargo tank 7P, with the measuring tape fastened above deck. Before the Solstraum could take on board new cargo, the cargo tanks had to be cleaned. In that connection, a tank cleaning meeting was held from 05:30 to 06:00 on 4 February 2011. The chief officer, the master and the pumpman were present at the meeting. The meeting reviewed the procedure for the cleaning work and prepared a plan/checklist. In accordance with the tank cleaning plan, the bottom of each of the cargo tanks 2P, 2S, 3S, 4P, 5P, 7P and 7S was to be flushed for five minutes with seawater, then cleaned for one hour with cold seawater with the hatches closed, and finally cleaned for one and a half to two hours with warm seawater (60–70 degrees Celsius) with the hatches closed. After cleaning with warm seawater, the chief officer was to be called to conduct tests. After that, the cargo tanks were to be cleaned for ten minutes with freshwater, and then ventilated, mopped and dried. In accordance with the tank cleaning plan, the cargo tanks 2P, 2S, 3S, 4P, 5P, 7P and 7S were bottom-flushed and the tanks were cleaned with cold seawater. The work of cleaning cargo tanks 2P and 4P with warm water had begun, when the pumpman instructed the deckhand on watch that he was to mount and start the fan for ventilating cargo tank 7P which is the cargo tank where the sampling device was stuck. The fan had been running for approximately five minutes when the pumpman called the deck crew member and asked him to stand watch by the hatch. The pumpman did not explain why, but the deck crew member understood that he was about to enter the tank. Both the deckhand and the pumpman were wearing filter masks. The pumpman took two deep breaths before climbing down the inside ladder on the forward side of the cargo tank. From the deck, the deck crew member keeping watch at the hatch saw the pumpman reach the bottom of the tank and walk aft. About halfway across the tank bottom, the pumpman turned back and moved quickly to reach the ladder. He started climbing, but halfway up the ladder he fell backwards, back into the tank. He fell approximately 4 – 5 metres (see image below), and lay lifeless at the bottom of the cargo tank. The time was then 14:45. The deck crew member who stood watch at the hatch ran aft to the control room forward of the accommodation area on the main deck to get help. He also contacted the officer on watch by VHF radio and informed him that the pumpman was lying unconscious at the bottom of cargo tank 7P. The officer on watch alarmed the master who waked up the chief officer. The chief officer ran up to the bridge. From his position, neither the deck crew member nor the access hatch for cargo tank 7P was within his line of sight. The chief officer then ran down to the control room to fetch a gas detector and a breathing apparatus. He then ran out and across the deck to the access hatch for cargo tank 7P. The deckhand who had been watch at the hatch had fetched a harness and lifting equipment, and a stretcher. After having informed the crew about the accident, the master called Radio Medico. After discussing whether the pumpman could have sustained physical injuries in the fall, and whether moving him would be inadvisable, it was decided to lift the pumpman out of the cargo tank. Before the crew entered the tank, the chief officer checked the atmosphere in the tank using the gas detector2 Readings were taken at several vertical levels in the tank. The oxygen content varied from 14.3 to 14.5%. It should be noted that in order to enter an enclosed space an oxygen content of approximately 21%is required. The LEL (Lower Explosive Limit) readings were zero. The time was then approximately 14:50. Due to the low oxygen level, the crew donned a breathing apparatus before entering the tank. By means of the harness and lifting equipment, the pumpman was lifted out of the tank at approximately 15:00. No pulse or heartbeat was registered. A helicopter with a doctor on board was requisitioned. The pumpman was laid on the stretcher and brought to the hospital on board, while cardiopulmonary resuscitation was administered continuously. The pumpman was also hooked up to a defibrillator, but before shocks were administered, the defibrillator returned a message to continue cardiopulmonary resuscitation. The doctor who arrived by helicopter declared the pumpman to be dead at approximately 16:00. The pumpman was then brought to his cabin. When the pumpman had been lifted out of cargo tank 7P, the tank was closed. New readings of the atmosphere were taken at 22:20. Use of a gas detector and a hose that went approximately half way into the tank, returned a methyl bromide reading of 0.1 ppm. After arrival in Rotterdam, the pumpman was examined by a Dutch medical team before he was sent home to Latvia. According to the report from the Dutch medical team, the cause of death was probably oxygen deprivation. The pumpman probably intended to retrieve the equipment for sampling the cargo when the accident occurred. At the time of the accident, the oxygen content at the bottom of the tank was probably below 7.2%. The nitrogen content was probably over 90%. In addition, the atmosphere at the bottom of the cargo tank contained some ethylene dichloride vapour at the time of the accident. Prior to the accident, the pumpman had not obtained permission to enter the tank, and a risk assessment had not been conducted. The atmosphere in the tank had not been checked and he did not use a breathing apparatus. The pumpman entered the tank wearing a filter mask. Filter masks can give a feeling of false safety in situations of this kind. Given that the atmosphere in the tank probably contained less than 7.2% oxygen and that a breathing apparatus was not used, the pumpman probably died as a result of oxygen deprivation. This is also supported by the report from the medical team that examined the deceased after the accident. The pumpman, who had extensive experience, was familiar with the risks involved in entering the tank. He probably thought he would be able to climb down the ladder, retrieve the equipment and climb back up again without an oxygen supply. 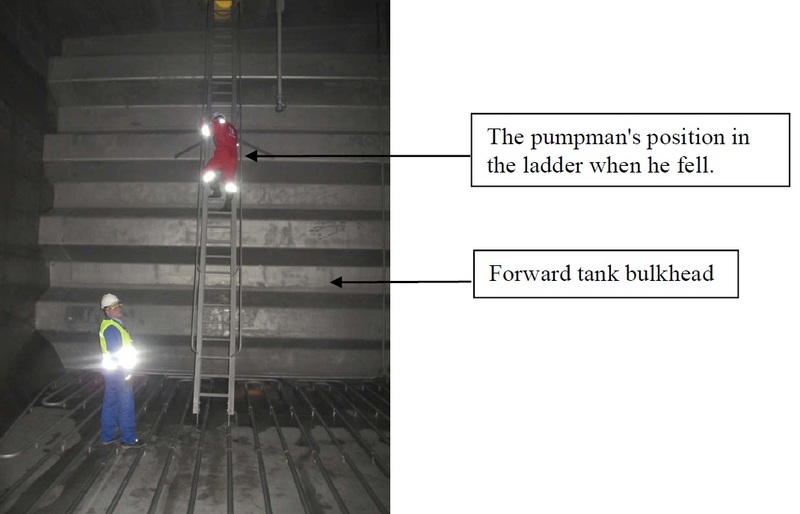 The deck crew member standing watch at the hatch when the accident occurred has told the AIBN that he understood that it was potentially dangerous to enter the tank, but that he could not have prevented the pumpman from entering the tank. In its investigation, the AIBN has not revealed any faults or deficiencies in those s of the shipping company’s safety management system that deal with matters of relevance to the accident. The AIBN believes that the accident was not due to a lack of knowledge, but to lack of motivation and correct attitudes in relation to complying with the procedures in the management system. On the voyage in question, procedures in the shipping company’s management system were not complied with, neither in relation to the pre-arrival conference, the tank cleaning meeting, logging of nitrogen inerting, nor entering enclosed spaces. It therefore seems that noncompliance with the management system did not only concern the deceased pumpman who entered the cargo tank without following the procedures for entering enclosed spaces. Enclosed spaces are to be properly ventilated and verified safe to enter prior to entry. Means of forced ventilation should be applied as necessary, also during inspection. Atmosphere should be monitored also during inspection by means of portable meter giving audible alarm in case of unsafe atmosphere. A team of two persons should carry out inspection of enclosed spaces. A safety watch of at least one person should be stand-by at the entrance to the space with means to communicate with the inspection team inside the space as well as with the duty responsible officer on board in case of emergency. Rescue equipment including breathing apparatus should be kept readily available at the space entrance in case of emergency. The oxygen content in a normal atmosphere is 20.94% by volume. No entry to enclosed spaces should be performed unless the oxygen content is close to this value.